Could your itchy rash be a symptom of eczema? It’s possible. Eczema, also called dermatitis, is a term that covers many types of skin problems. The way to know for sure whether you have it or not is to see a doctor. But there are some common warning signs you can watch for. People usually have their first eczema symptoms when they’re babies. But children and adults can have the condition. No two people have exactly the same symptoms. Rashes tend to come and go. With time, they can get crusty and scaly. Some types of eczema can also blister, leak fluid, crack, or peel. An infection or too much scratching can make your symptoms worse. It can even make your skin thick and leathery. Sometimes, you may have other skin changes along with eczema, such as small raised bumps or hives. Or, you might have an extra fold of skin under your eyes. When you scratch too much, your skin might break open a little. This allows bacteria or viruses to get inside and can lead to an infection. Sometimes, the medications you take to control eczema can also cause other health problems if you take them for a long time. Although eczema symptoms tend to die down as babies get older, people who had the condition as infants are at higher risk for other skin problems throughout life, like sensitive skin, infections, or eyelid dermatitis. 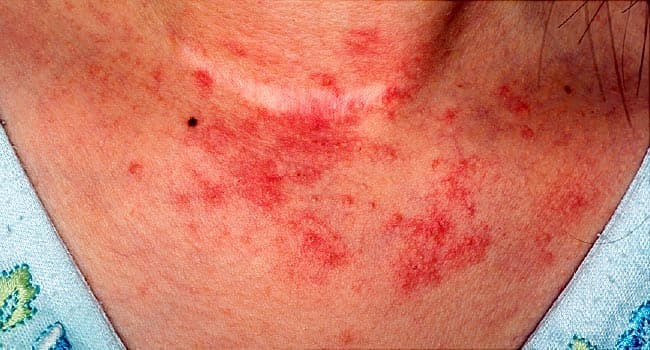 The doctor can sometimes tell by looking at a rash whether or not it’s eczema. But it may take more than one visit to rule out other problems. The doctor might also refer you to a specialist, such as a dermatologist or allergist. There's no test for eczema, but allergy testing can help pinpoint any allergic triggers. Other common triggers include irritants, heat, or stress. What's the cause of my eczema? When should I call you about my symptoms? National Institute of Arthritis and Musculoskeletal and Skin Diseases: "Atopic Dermatitis." American Academy of Family Physicians: "Eczema and Atopic Dermatitis."